A lively evening of barbershop harmony will be presented by the Visiting Artists Series on Friday, February 3, at 8 p.m. in Salter Concert Hall in the Fine Arts Center. The concert will feature two championship barbershop quartets, Anthem and Instant Classic. Anthem was formed in the summer of 2009 to sing the National Anthem for an Army birthday celebration event. Shortly thereafter, they entered and won the Cardinal District Quartet Competition and were crowned 2009 Cardinal District Quartet Champions. 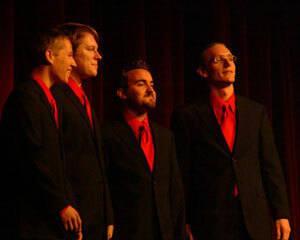 In the spring of 2011, they qualified to be one of the Cardinal District representatives to the International Quartet Competition in Kansas City, MO. Since forming, Anthem has been thrilled to perform on chapter shows and other chapter events, and was honored to sing the National Anthem at an Indianapolis Colts preseason opener. Members of Anthem include a Sergeant in the United States Army, an aerospace engineer, a cardiologist, and a recently retired corporate CEO. 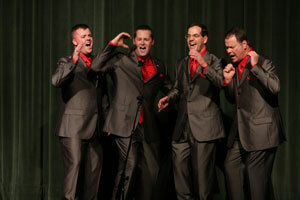 Their repertoire includes barbershop favorites, show tunes, patriotic, and inspirational selections. Instant Classic includes David Zimmerman, Theo Hicks, Kohl Kitzmiller, and Kyle Kitzmiller. They formed and entered their first competition in 2009. Since then, they have performed at a number of venues in Indiana and Canada, and have worked with several coaches, including Scott Kitzmiller, Bob Kendall, and Brian and Jean Barford. Instant Classic has performed twice in the International Collegiate Quartet Competition, in Anaheim and Philadelphia, where they placed 8th and 10th respectively. More recently, Instant Classic was named the 2011 Cardinal District Champions. They will compete this spring for the chance to represent the Cardinal District at the 2013 International Barbershop Competition in Portland. The Wabash College Glee Club will join both quartets to perform “Sold” for a rousing concert finale. Anthem and Instant Classic will present an afternoon workshop on Friday, February 3, in Salter Hall, which will begin at 1:30 pm and last about an hour. The workshop will include a brief history of barbershop singing, along with demonstrations of some of the unique musical characteristics of barbershop. The attendees will also have the opportunity to learn and sing several “tags,” which are special endings to barbershop songs. The workshop is free and open to the public; no tickets or reservations are required for the workshop.